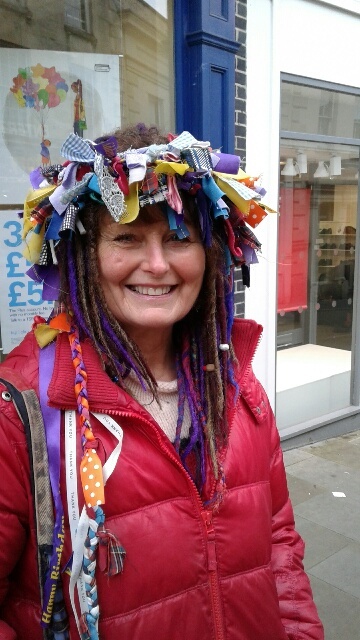 There’s going to be so much new and exciting stuff happening around Stroud on 12 January. 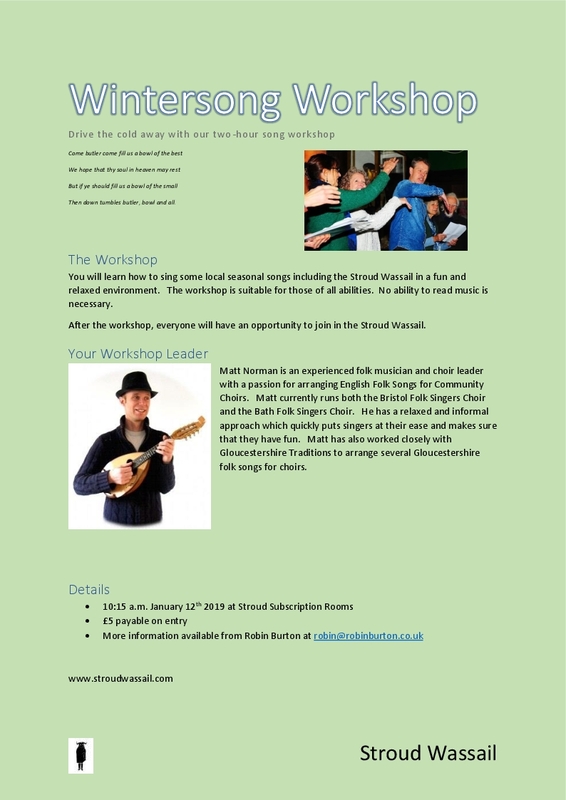 Check out the Wintersong Workshop at the Sub Rooms in the morning, and learn some traditional Gloucestershire seasonal songs to drive away the winter blues. Contact Robin for further details. Nasty Tom Long and Bold Captain Forest Green Rover fight for the love of fair Daisy Bank. 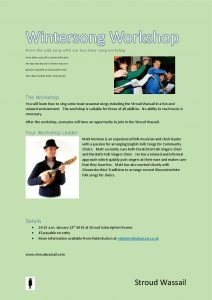 This winter the Stroud Wassail Mummers will once more bring music, mayhem and laughter to the Five Valleys. If you fancy having a go, then come and sing and act with us. No pay. Unsocial hours. Unreasonable boss…. What’s not to like? Contact the Slavemaster for further details. 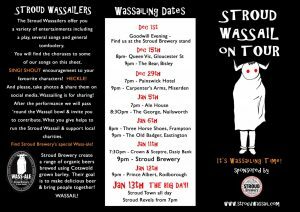 The Biggest Wassail in the UK? With some 34 morris sides and mummers plays, rumour has it that Stroud Wassail has become the largest Wassail in the UK. We can’t verify that, but we were pretty impressed by the number of sides that came from places as diverse as Devon, Suffolk, Leicester, Birmingham and Cardiff to join in. We had a fantastic day, with members of the public joining in, making it a true community event. We’ve got a brand new Stroud Mummers Play; we’ve got a beautiful new Five Valleys Wassail song, written especially for us by Johnny Coppin; we’ve got a very badly-behaved inebriated horse who will steal your heart and your cider; and we’ve got a bunch of wassailers who are happy to turn out on a mid-winters night to entertain YOU! 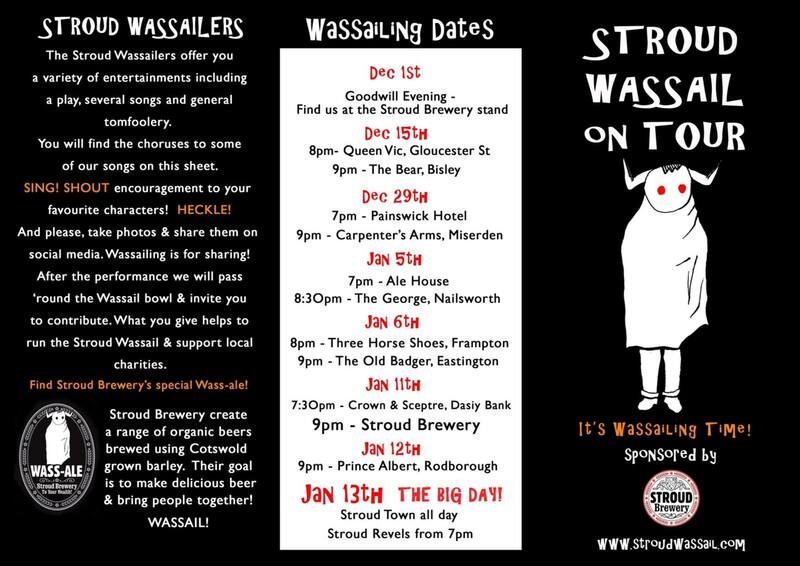 Come and say hello to us on our fantabulous Stroud Wassailers tour – coming to a pub near you. What’s this? 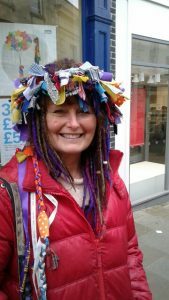 Has the Wassail Broad died and gone to heaven? Oh no!! 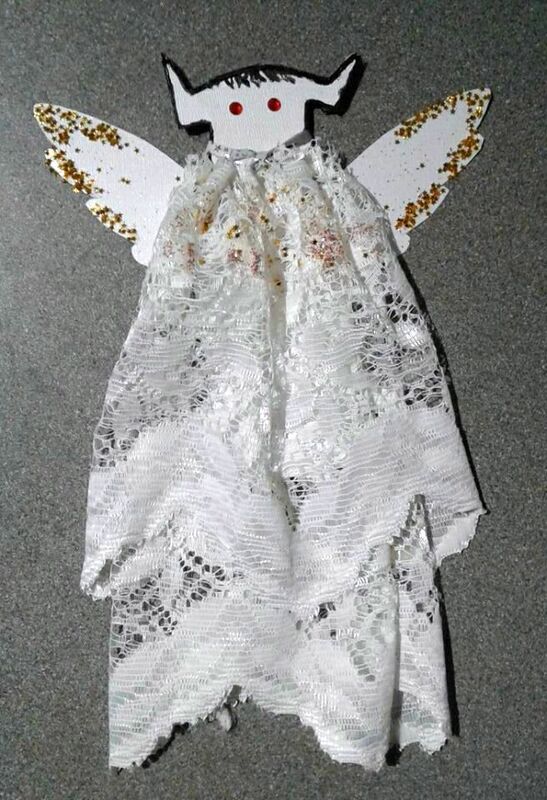 No, just kidding, this is the angelic Broad who will be sitting on top of our Stroud Wassail tree at the Christmas Tree Festival at St Laurence’s church from 24 November onwards. Strange goings on in the Ale House tonight – blokes in top hats, blokes in curly wigs, an unruly horse…. 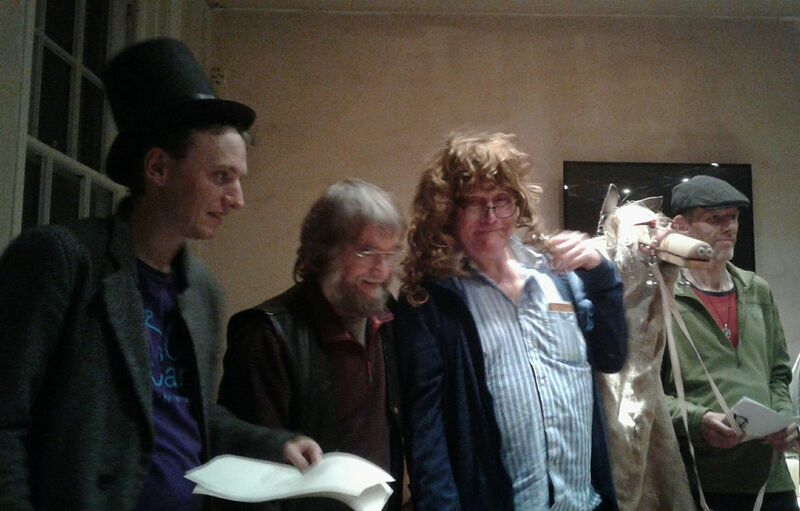 the first rehearsal of the brand new Stroud Wassail Mummers Play, coming to a pub near you this winter. A tale of love, dark deeds and dodgy doctors, but ***SPOILER ALERT*** it all turns out ok in the end. This weekend the streets of Stroud were filled with morris dancers, musicians and, er, minotaurs, for the Stroud Folk Weekend. We took the opportunity to present Stroud Food Bank with a cheque for £500, which we raised from the proceeds of the 2017 Wassail. We hope to better it for the 2018 Wassail. Here we have from left to right Robin (Wassailer), Robin (Wassail Chairman – confusing, eh? 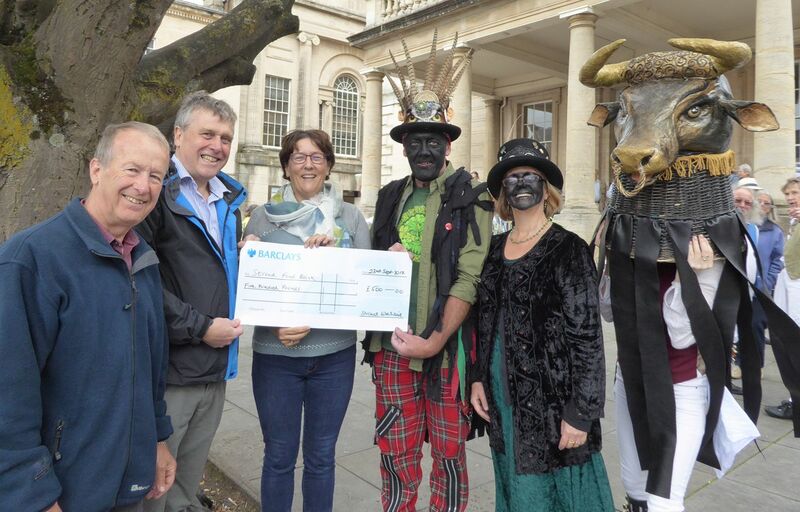 ), Sue Beattie from Stroud Food Bank, Gary Kelly (Wassail Committee member), Christine Lee (Wassail Secretary) and Alex Merry (Wassail Committee member and part-time minotaur). Gary, Chris and Alex are all morris performers, which explains the strange garb. 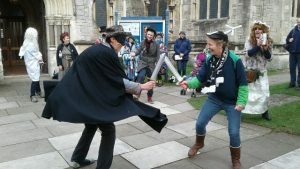 Invitations to morris sides and mummers to perform at Stroud Wassail 2018 are currently being sent out, but we’re also encouraging any kind of street performer to join in. 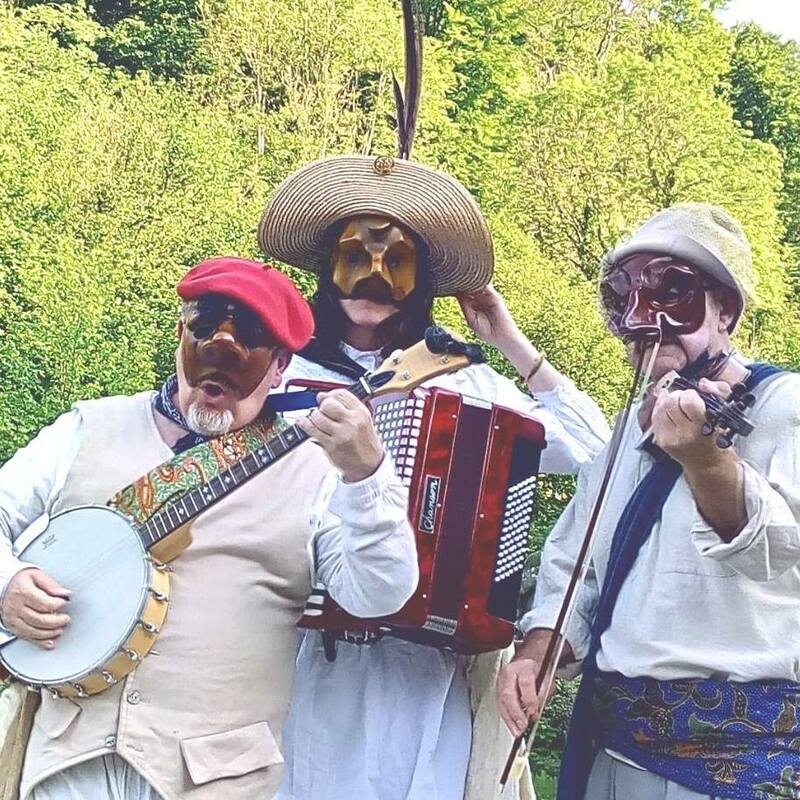 First to sign up are the Stroud-based strolling minstrels the Masqueing Band. If you have an act to show off, then please get in touch.